Michael Burford's Lame Blog: How does Jacuzzi stay in business? About 3 years ago, we finished a big remodel on our house, including a nice big tub for two in our bathroom. After several visits from the contractor, the plumber, the special Jacuzzi plumber, and holes in both the ceiling of the kitchen and around the tub, they fixed the leak. Great. Forward about 9 months. I came down again, to find another puddle. 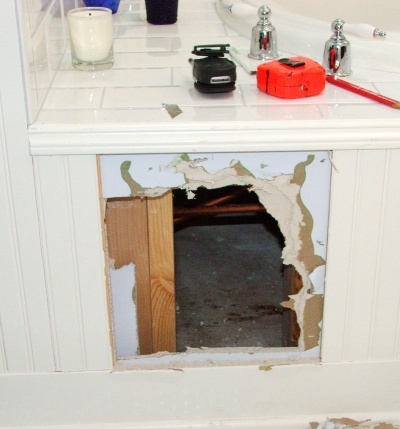 The Jacuzzi plumber returned, another hole in the wall by the tub, but he though he had it fixed. We got in for a bath the next day, but heard a noise. I checked the kitchen and it was like a waterfall. By the time we drained the tub, over 2 gallons had come down into the kitchen. We ran around naked, finding pans to catch the water and every towel to mop up the mess. After another attempt to fix, the Jacuzzi plumber decided to just have them send us a new tub. That arrived, and they set it up to test in the garage...and none of the electric things worked. I think they made 2 more trips up (they're about an hour drive from our house), with every part they could replace, and still couldn't fix it. So they had Jacuzzi send ANOTHER tub. So at this point, Jacuzzi has shipped 2 giant tubs--they're big, something like 7 feet by 3x3 crates, so must cost a ton. Thankfully it's all been covered by warranties. The plumber had it shipped to his house, so he could test everything before making the drive to replace it. Finally, over six months after that drip in the kitchen, we had a working tub. Yeah! Until last night. We both heard a noise. Fortunately, we'd procrastinated, so the hole in the wall hadn't really been fixed--just the board covering the hole. So I could quickly see it was leaking AGAIN! How does Jacuzzi stay in business? Their plumbers have visited our house 6+ times; at an hour drive each way. For the initial leak, I know the contractor charged them a lot to fix all the holes in the newly finished house. They've sent 2 extra tubs (at no charge to us, thankfully). The plumber is about to visit again.